GENEVA – Why is the Higgs boson - posited by an atheistic physicist nearly 50 years ago - called the 'God particle'? The answer is as simple as it is profound. The Higgs has been dubbed the "God particle" because scientists say it is powerful and everywhere – critical to conferring mass on everything in the known universe, and to keeping the same together - and yet it has been so hard to find. Peter Higgs, the now 83-year-old physicist who first theorized the boson's existence 48 years ago, actually frowns upon the term. A modest man, Higgs is said to have cringed every time the term "Higgs boson" was used in his presence and studiously avoided using it. But as a self-proclaimed atheist, Higgs disliked the boson's other name, "God particle", even more. Whatever people prefer to call it, after a quest spanning nearly half a century, physicists said Wednesday they had found a sub-atomic particle that may be the elusive Higgs boson, believed to confer mass on matter. 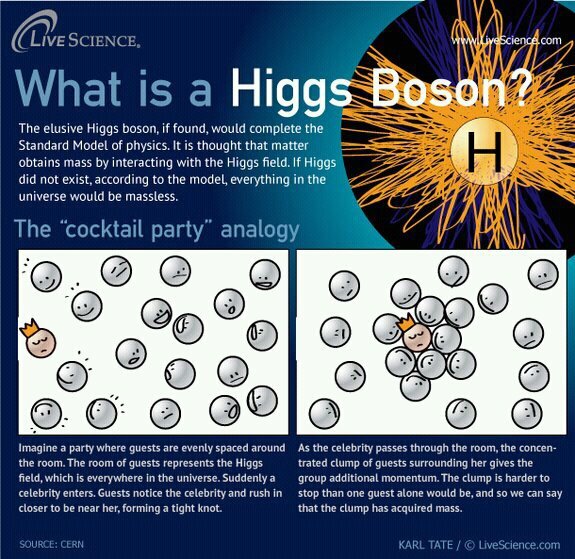 The infographic below, from the website of LiveScience.com, has another celebrity-centered analogy to illustrate how the Higgs particle is essential to the very concept of mass in physics. Click on the image to view a larger version in a separate window. In the video below, Fermilab scientist Don Lincoln uses the concept of water to expound on how the Higgs particle and the Higgs field is essential to everything that surrounds us.